While Chris was away on his annual ski weekend with his friends, Babci came to visit. Although we missed him, the kids had full days of playing. They did crafts, played hockey, colored and built some of the "big boy" Legos Richie got for his birthday. You can see his new sea plane here. He is VERY proud because he knows they are for big kids. Richie had his 4 year well visit at the doctor today. He seemed so old because they did a hearing and vision test. I remember when we used to have to strip him down and lie him on the scale! Everything looks great although the doctor is slightly concerned with how skinny he is (he only weighs 30 pounds!). Poor thing had to get 4 shots and a blood test (we want to rule out any possible slow growth problems like Celiac). Chris is also going away with his friends skiing this weekend so he picked Richie up from school to do something fun.....sledding! 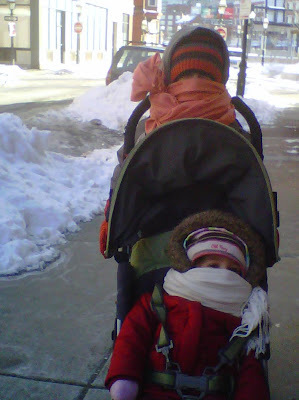 We had a bit of a cold snap (putting it mildly) in Boston today!! It was well below zero when we left the house this morning. This is how the kids came home from school pick up. Dawn is so resourceful! We had the BEST birthday party in the whole world (again!) at our ice rink. Richie is just addicted to hockey and getting really good at his skating, so it was a no brainer as to what we were going to do for his 4th birthday. I invited everyone we knew (literally) so Richie had so much fun skating with all of his friends and family. There are so many other pictures to post, but there just isn't the room here (the rest are on Snapfish). We almost had no cake, a few good friends were sick and couldn't come, and the snow threatened to keep others away, but we got through it all for the best birthday party ever! As you can tell from the smile on his face in these pictures, Richie couldn't have asked for anything more. A special thanks to everyone who was there. You made this a special day for my baby (I mean big boy) and he is very lucky to have each and every one of you in his life! Before Richie's big 4th birthday party we had the arrival of Babci and Uncle Jim's family. That meant lots of presents (goalie equipment from Jakie and Joshie, Nok hockey from us and lots of Spiderman from Babci) and lots of playing. The morning before the party we hit the Children's Museum. And the birthday weekend begins.....today was his school celebration. 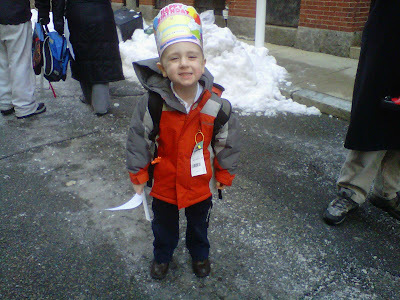 A birthday hat and munchkins for the class....wish I was there! Richie got his first birthday present and it could turn out to be his favorite. 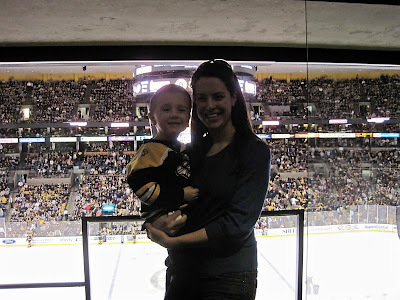 Aunt Erin scored him tickets to the Bruins game in her law firm's luxury box! She said he didn't want anything to eat or drink (even soda!) for most of the game. He just wanted to watch. He doesn't get up in between periods (it is his favorite time because the little kids get to play) and he has to stay until the end. Richie basically invited himself to dinner at Lisa's because he said he was mad Angela had been there but he hadn't. Of course he had, but he didn't remember (and he remembers EVERYTHING!). The Hardings' came as well and we enjoyed Lisa's delicious pulled pork. The kids did a great job entertaining themselves with the "toys" Lisa had in the house. Angela followed Maddie around and the kids tortured her cat Jasmine. And I think I got a pretty darn good picture of baby Nate with a HUGE smile! Just an average day in our house.....Richie using ANYTHING to play hockey with.......and Angela in her bling. The belt (from Aunt Karen) and the ruffle jeans, kill me! We had a special snow day today because all four of us were able to stay home and NOT work. We played games, made pizza and the boys went out to play. As you can see, they built a bigger snow man this time and Richie got to try out his new snow shoes. I can't wait for all of us to get out for a winter hike. Regina LOVED the snow man. She tried to eat him as he was getting built (thinking they were making her a huge snow ball to chase). And then when the snow man was done, Regina took off with one of its stick arms to chew. We finally saw Aunt Erin and Uncle Matt so we could exchange Christmas presents with them. We also got presents from Grandpa, Nana Sheila and Aunt Kim. Thanks everyone! Wish we could have opened them in Florida. Regina also got a few presents and she has been playing with them the most. We think maybe we have been neglecting her and have not bought her a new toy in a while the way she is loving her new ones! Sorry Feeny girl! We spent this Saturday afternoon with Colton and his parents. Kelley and Nick saved our lives last week when Chris and I were both really sick (they took both of the kids out for dinner a movie). Because of this, we felt like the least we could do was take them out to lunch. Since we let the boys pick where we were going to eat we wound up at The Boston Beer Works because it is both of their favorite restaurant. They love all of the kids meals, but today they both picked the ribs. Yep, look at these two men and their big plate of pork! Last year Grandpa and Nana Sheila gave us a juicer and a box of oranges. This year we were lucky enough to get another box (we hope this is a tradition!). The kids have been enjoying them and we rated the 5 different types of oranges this year. The tangerine was everyone's favorite. Although the juicer is at Aunt Erin's house, we still got our delicious fresh squeezed juice for breakfast with just a little elbow grease.